No-Buy January is over and I still haven't even bought anything new! I found the challenge of not buying any new beauty products surprisingly easy! I'm running low on a few things now so will be making some online orders soon. There's a few things I've added to my wish list recently, but as always I doubt I'll end up getting most of them for a while yet while I save up my pennies! Scotch Naturals Nail Polish (RRP £13.50) - I love my nail polish and it's one of those guilty pleasures of mine that isn't totally natural, although I do stick to at least 3-free! Scotch Naturals create non-toxic water-based nail polish and I don't know why I haven't tried them out yet! These shades "Leprechaun Lynch" (mint colour) and "Highland Fling" (coral colour) look amazing and would be perfect for spring and summer. Antipodes Rejoice Light Day Cream (RRP £25.99) - I've been wanting to try out products from this New Zealand based brand for so long and I think this day cream would be a great place to start! I'm almost out of my current daytime moisturiser and want to try something new that's light enough to use under makeup. Here's hoping! Indie Lee Blemish Lotion (RRP £18.00) - I don't get all that many blemishes to be honest but when I do I like to have an army of products to tackle them with! Although I already have a few products for tackling those blemishes (you can read all about my current "Blemish Busting Heroes" here), it can't hurt to add one more to the collection, especially considering I've heard nothing but great things about this product! Aurelia Miracle Cleanser (RRP £34.00) - This price tag is far more than I've ever spent on cleanser before (almost double actually! ), but I would sooo love to try this one from Aurelia! I tried some samples of their night moisturiser and serum last year (review here) and they were gorgeous. I can only imagine this cleanser would be too! Those Scotch shades are so beautiful and summery!! I love mint and coral. Isn't it funny how a no-buy seems so hard at first, but gets easier as it goes on? I went on one last summer for three months and by the end of it I didn't even miss shopping. Plus I managed to use up a lot of old products in my stash! I reallllly love that mint color nail polish. That would be perfect to wear for the upcoming Spring season!!! Happy Shopping! Those Scotch nail polishes are gorgeous. I especially like the mint one. I don't have many spring time nail polishes so I might have to buy some as a little treat to myself. Loving the nail polish shades! Wonderful wishlist, you make me discover a lot of those products for the first time, and I now think I need them all! 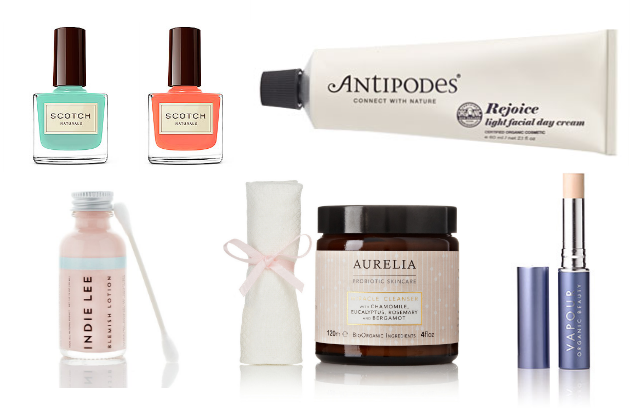 The nail polishes sound so great, I always wanted to go on a more natural side for my nails, plus both the shades are lovely; also the Aurelia cleanser, the Indie Lee Blemish Lotion and the Vapour concealer are calling my name! I hope that Vapour has a shade that matches my skin tone, it seems like a great natural concealer. I love that Naturisimo offers samples! It's funny because I usually try and go cheaper with my cleansers too, but so glad I had the chance to try Aurelia's one because I'm now a convert! Make's so much difference having a great cleanser...if you're into a rich creamy formula that doesn't leave a film or residue on the skin after washing off then you'll love it :) Also kudos to the Vapour concealer, mine is running out far too quickly though. The nail polishes look gorgeous! I'm really intrigued by them as I didn't realise you could get natural nail polishes like that!